A day after telling him to take a leave of absence, USC fired head coach Steve Sarkisian on Monday in the wake of his reported alcohol problems. It’s just the latest example of mismanagement for USC, leaving AD Pat Haden with plenty to answer for. We don’t know what is next for USC, but that’s O.K., because USC doesn’t seem to know what is next for USC. Just look at the last three days: Steve Sarkisian went from head coach Saturday to indefinite leave Sunday to fired Monday. USC may take away his season tickets by Wednesday, kick him out of Los Angeles entirely on Thursday, then bring him back to coach again Saturday. Sarkisian apparently has a drinking problem, a serious problem that USC did not take seriously enough, until he lost twice and the problem was apparently so obvious that even USC had to notice. But then, USC has a habit of conducting business with its eyes closed. Look at the football program’s recent history. Athletic director Mike Garrett hired Lane Kiffin, ignoring Kiffin’s habit of alienating people and underachieving, because Kiffin was an assistant coach during the Pete Carroll era. That failed. Pat Haden replaced Garrett and fired Kiffin. But then Haden made the very same mistake Garrett made, or at least that mistake’s twin brother: He hired Steve Sarkisian, ignoring Sarkisian’s history of losing to inferior teams and drinking too much at Washington, presumably because Sarkisian was an assistant coach during the Pete Carroll era. Then came the whopper: When Sarkisian was apparently drunk and clearly inappropriate at a USC donor event in August, USC acted like it had never dealt with an employee with a substance-abuse problem before. The ensuing press conference was telling. The school let Sarkisian say he didn’t drink that much but mixed alcohol with medication, as though no alcoholic has ever used that excuse before. Then, inexplicably, he said he was seeking treatment, but wouldn’t say what kind, and he said he would stop drinking this season, but wouldn’t say anything about after that, and anyway, he wouldn’t go to rehab because he didn’t think he had a drinking problem. Does USC even have a human resources department? 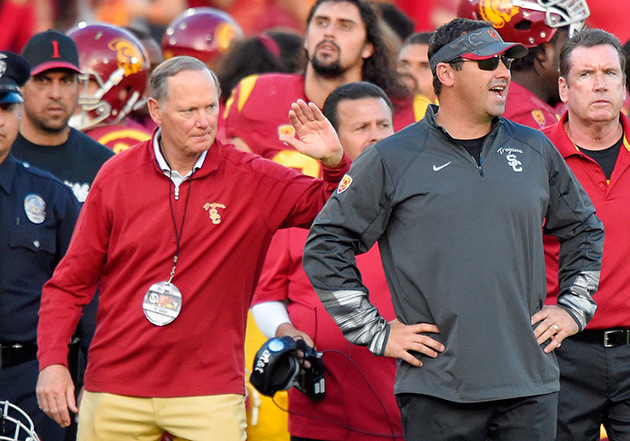 • STAPLES: Punt, Pass & Pork: How does USC move on from Sarkisian? Nobody should demonize Sarkisian. He has a problem. But he had it in August, and Haden should have seen it, or at least tried to see it. Instead, Haden did what USC has done since the day Carroll announced he was leaving for the Seattle Seahawks: He did whatever seemed like it might work that day, and figured USC would recover because hey, it’s USC. College football does not work that way anymore, on or off the field. And Haden did a gross disservice to Sarkisian. I’m sure he didn’t mean to enable his head coach, but that’s what he did. You can’t ban alcohol in the coaches’ locker room without asking: Why was there alcohol in the coaches’ locker room? That’s a workplace, isn’t it? Sarkisian did what people with alcohol problems do: He rationalized, he minimized, and he told himself he could control himself. That’s why the word you hear so often associated with alcoholics is help. It’s a hell of a disease to beat by yourself. ​Haden did not help Sarkisian in August. And Haden owes people some kind of explanation for what happened between Sunday, when he said his head coach was “sick,” and Monday, when he fired him. Because right now, it looks like Haden said what he thought sounded good Sunday, then decided Monday that it wasn’t good enough. I’m sure Haden had reasons. And he obviously can’t give every detail of an employee’s personal problem. But simply saying he did “what is in the best interest of the university and our student-athletes” is too vague. Haden’s love for his alma mater is clear, just as Garrett’s love for his alma mater was clear. But USC’s last two coaching hires were lousy choices, and that’s not second-guessing. People said that the day Kiffin and Sarkisian were hired. So: Where does USC go from here? USC is still the best job in the Pac-12, by a wide margin. When Kiffin took the job and said it was the best job in the country, he might have been right. The school has a habit of drilling in old wells—of the last five head coaches, three (Kiffin, Sarkisian and Paul Hackett) were former USC assistants, and a fourth (John Robinson) was a former USC head coach. There is something to be said for hiring a coach who knows the school. But it would be nice, for once, if the school knew who it was hiring.